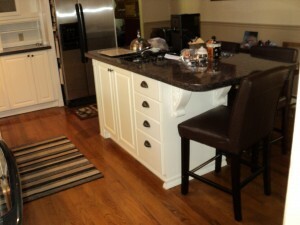 clients that didn’t realize their out dated and worn cabinets could be painted. That’s how it started and now it has become more then a niche, cabinets now account for at least half of my business. To do it properly the first time, does, however take a great deal of preparation and knowledge of products and procedures. Then to achieve a professional finish requires a spray booth with quality spray equipment, which I have, an important consideration when deciding who will rejuvenate your tired or dated cabinets. It all comes down to quality of finish, would you be happy with the brushed look or would you rather have the finish on your doors the same level as your car? Since I started to spray painting cabinets, products have evolved to the point that harsh solvent based finishes are no longer needed to provide a flawless durable finish. The technology for these durable products could even be under your feet as in the finish used for your hardwood floor. This is even true for the auto industry, water borne finishes are now the norm. How does this affect you? Well for starters these finishes help the environment by putting far less harmful VOC’s into the air we breathe and less harmful chemicals into our water or land. Also the savings for the customer using water based over solvent is significant. For the most part, water borne lacquers require no catalyzing and they can be thinned and spray equipment be cleaned with water, so less materials are needed. As I said things have changed dramatically over the years, not only for the finishes used but even for the trends in cabinets. Twenty years ago oak was the rage and painted cabinets were considered to be passé and dated. Now exactly the opposite is true, while oak is still used along with other species such as maple and cherry, the look has changed. It’s rare to see natural woods and the trend leaning towards dark stains as well as colored lacquers. While lighter colors are still used it’s more trendy on painted cabinets. Another trend I’ve started to see in recent years is having two colors on cabinets. 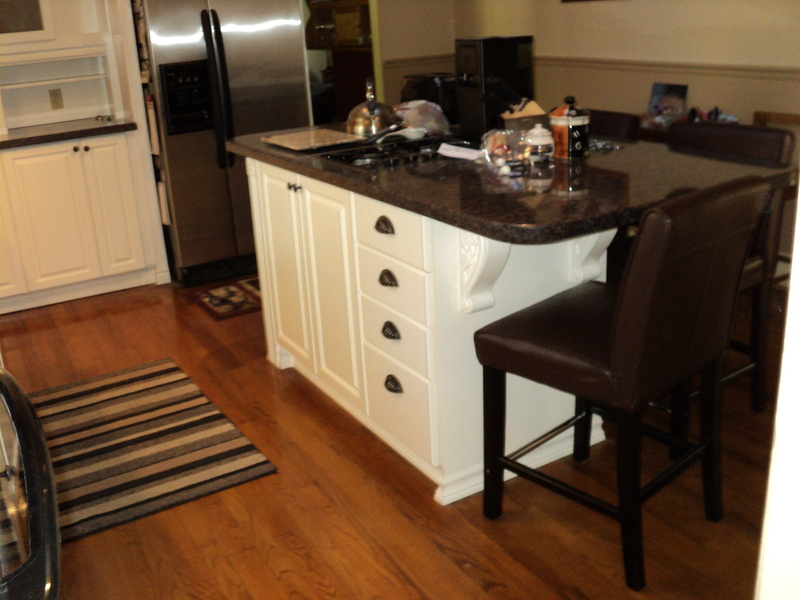 Usually the island being a darker color then the main body of cabinets or even the upper and lower cabinets being different colors. This look can be absolutely stunning when the right color combinations are picked. Not happy with the style of your cabinet doors but the boxes and drawers are still in good shape? I can help there as well by replacing the doors to a style and material of your choice. How about some crown molding or light valance? Changing the door and drawer pulls can be also done to add to the wow factor or even soft close door and drawer hardware. The possibilities are only limited to your imagination. The first step in taking your tired, worn out and dated kitchen to stunning is to contact me. Allow me to use my 30+ years of knowledge to make your dream a reality for as little as 12% of the cost of replacing your cabinets.